Now, not to make any guesses or jump to conclusions here, but someone once said those “McLaren” things aren’t cheap. And price tags always tend to rise when you put your own spin on something, so customizing one sounds like quite the expensive endeavor. Customizing two? Well, then. Here are two such presumably expensive custom cars, which McLaren didn’t and may never disclose the price tag of, bought by an owner as a matching pair. They don’t fully match, you see, as one has a roof and the other has an optional roof, but even siblings aren’t mirror images of each other anyway. McLaren calls these the MSO R Coupé and MSO R Spider, with the “MSO” part of the name standing for the McLaren Special Operations division—a fancy and pricey way of referring to the automaker’s customization department. 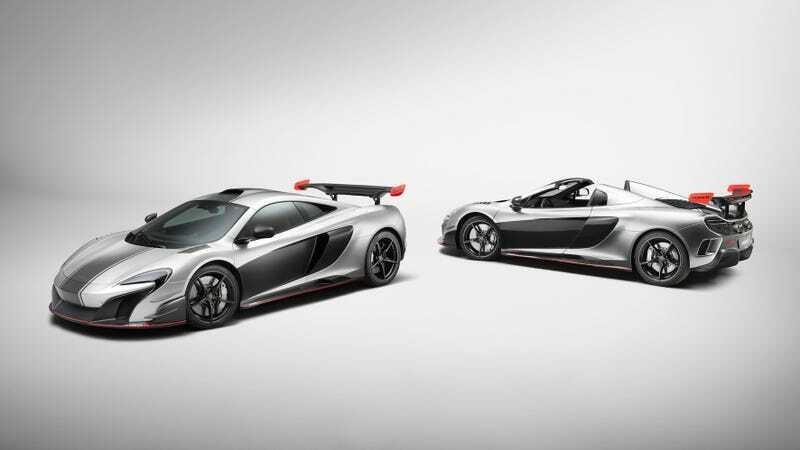 The two cars are based on McLaren’s older-generation Super Series vehicles, including the 650S and 675LT. The twin (ha! )-turbo V8 engines make 679 horsepower and 516 lb.-ft. of torque, and both cars are covered in carbon fiber because the general rule in this life is to “carbon fiber all the things.” The cars also covered in MSO markings, which are a status symbol among the people who actually know what MSO stands for. If you’re getting any ideas here, it’s probably safe to say that you’re better off buying some matching Hot Wheels cars than actual supercars. The market is great, sure, but you can always get the same effect for a lot less—on Instagram, at least—by zooming your camera in close enough to the toy versions. Throw in a miniature gold fountain in and your likeness and you’re set, without having to set back your kid’s college fund. Sounds like a good deal all around, minus the driving part. But what kind of rare supercar owner actually drives a car, anyway?